I have returned from my time away, and NYC has once again embraced me with its hyper-energized arms. I’m happy to be back, but since my return, I’ve missed swinging in the hammock we had in the backyard between two big trees. Have you been in a hammock lately? What is it about a hammock that makes relaxation such an art form? 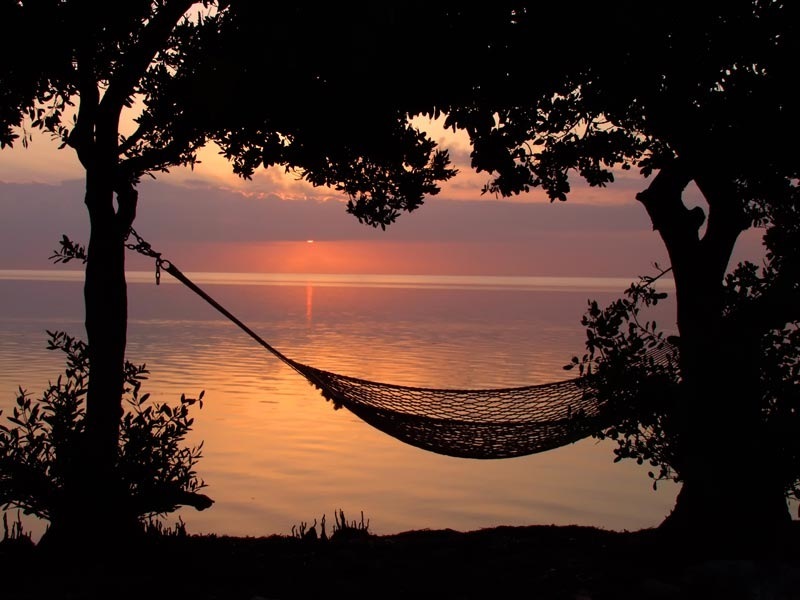 I can’t decide if it is the "hug" of the shape or the view of the sky or the gentle rock in the breeze that makes hammock-hanging so divine. Over my break, the hammock became my alternative office. I read there. I caught up via phone calls with old friends, I meditated, I dreamed. I calculated when there would be perfect shade for journaling glare-free, and when the sun would peek through as I enjoyed gentle rocking with an evening cocktail or my morning tea. As I sit here in a hard desk chair at my office, I can’t help but wonder if we should find a designer to create a hammock work chair, or a corporation to inspire an outdoor office environment where cubicles are replaced by trees and hammocks. Productivity might decline due to spontaneous napping, but it could be argued that it might increase too. If the workforce had the blissful breeze as a companion to their thoughts instead of recycled office air, if we had birds to chirp above instead of annoying coworkers bickering over statistics, wouldn’t we like to go to work more? Might we not feel more creative and inspired in our brainstorming? Taking a midday savasana would not be a bad idea either; we could take a break at the time when productivity dips the most and then get back to work, refreshed. I realize the hammock-village company model is a romantic idea... but one can daydream, right?